Mizuno S18 Gun Metal Wedges - Price Drop!!! The S18 wedge is the newest member in our family of performance wedges with advanced center of gravity positioning. In the higher lofts, mass is shifted up the blade delivering more consistent spin rates on strikes from high on the clubface (common with more extreme lofts). A true specialist wedge in every aspect (sole grind, profile, beveled top line and groove depth) from the 46-degree pitching wedge replacement to the 62-degree lob wedge in a midsize, rounded profile. Grain Flow Forged with Boron for grooves that stay sharper longer. All Shafts Can be substituted at Zero up-charge. Length and Lie Angles can be adjusted through the Custom Department. 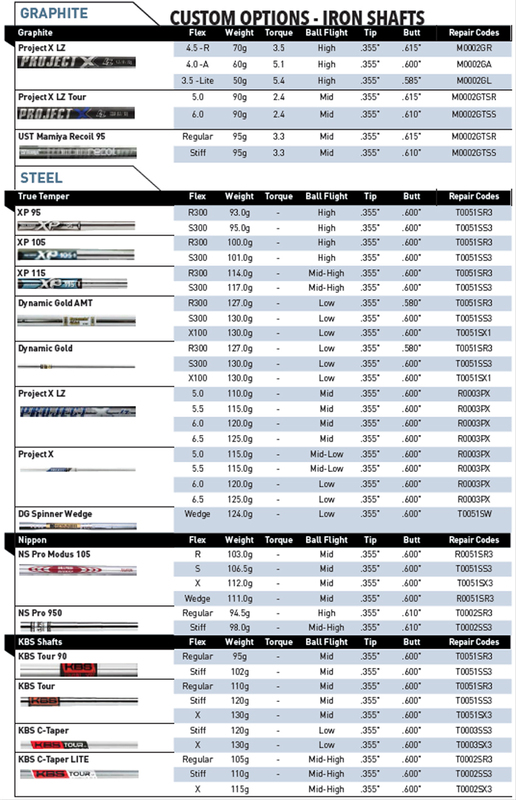 Also, any of the shafts listed on this product page can be substituted for the True Temper Dynamic Gold Wedge Flex Shaft. Once the order is placed - call 888-453-0102 for additional customization or leave customization requests on the notes when placing the order.